The present Military Order of the Bath, founded by King George I. in the year 1725, differs so essentially from the Knighthood of the Bath, or the custom of making Knights with various rites and ceremonies, of which one was Bathing, that it may almost be considered a distinct and new fraternity of chivalry. The last Knights of the Bath, made according to the ancient forms, were at the coronation of King Charles II; and from that period until the reign of the first George, the old institution fell into total oblivion. 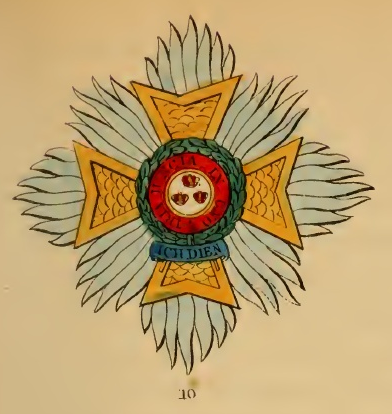 First Class - to consist of Knights Grand Cross ; number not to exceed, for the military service, fifty, exclusive of the Sovereign and Princes of the blood royal, and such distinguished foreigners as may be nominated honorary Knights Grand Cross; and twenty-five for the civil service. Second Class - Knights Commanders, number not to exceed, for the military service, one hundred and two, and for the civil service fifty, exclusive of foreign officers who may be admitted as honorary Knights Commanders. In the event of actions of signal distinction, or of future wars, the numbers may be increased of this as well as of the third class. 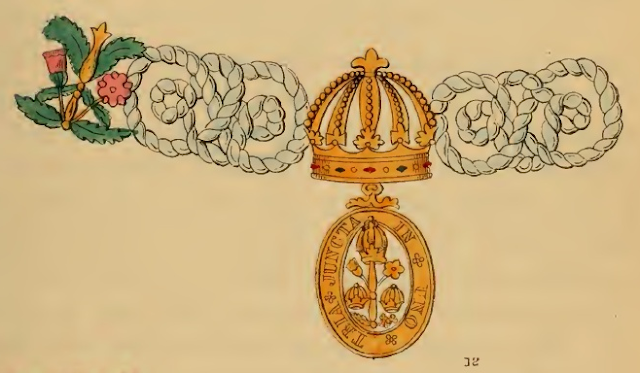 The members of the second class are entitled to the distinctive appellation of knighthood, after being invested with the Insignia; to take precedence of Knights Bachelors; to wear the badge, &c., pendent by a red ribbon round the neck, the star embroidered on the left side. Third Class - Companions of the Order, to consist, for military service of five hundred and twenty-five, and for the civil service of two hundred ; they are to take precedence of esquires, but are not entitled to the appellation, style, &c., of knights bachelors. To wear the badge assigned to the third class, pendent by a narrow red ribbon from the button-hole. No officer can be nominated to the military division of the third class of the Order, unless his services have been marked by special mention of his name in the London Gazette, as having distinguished himself in action against the enemy. This class has never been conferred on any officer below the rank of Major in the army and Commander in the navy. The Badge for the Military Classes of the Order is a gold Maltese cross, of eight points, enamelled, argent; in the four angles, a lion passant-guardant, or. ; in the centre, the rose, thistle, and shamrock, issuant from a sceptre between three imperial crowns, or within a circle, gules ; thereon the Motto of the Order, surrounded by two branches of laurel, proper, issuing from an escrol, azure, inscribed Ich Dien (I serve), in letters of gold. It is worn by the Grand Crosses pendent from a red ribbon across the right shoulder, by the Knights Commanders from the neck, and by the Companions from the button-hole. The Collar is of gold (weight, thirty ounces Troy weight), and is composed of nine imperial crowns, and eight roses, thistle, and shamrock, issuing from a sceptre, enamelled in their proper colours, tied or linked together with seventeen gold knots, enamelled white, having the badge of the Order pendent therefrom. The Star of the Military Grand Crosses is formed of rays or flames of silver, thereon a gold Maltese cross, and in the centre, within the motto, branches of laurel, issuant as in the badge. The Civil Knights Grand Crosses retain the old badge and star of the Order. The Star is of silver, formed with eight points or rays, charged with three imperial crowns, proper, upon a glory of silver rays, surrounded with a red circle, upon which is the motto of the Order. Their badge is of gold, composed of a rose, thistle and shamrock, issuing from a sceptre between three imperial crowns, encircled by the motto. 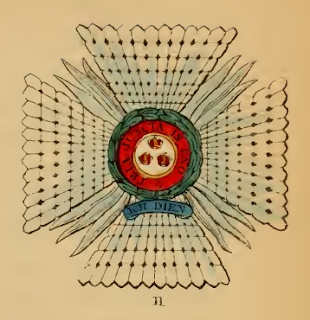 The civil Knights Commanders wear the same badge, of a similar size, round the neck by a red ribbon, and the civil companions the same, but of a still smaller size, from the button-hole, pendent from a red ribbon. The Star of the Knights Commanders is in the form of a cross-patee of silver, having the same centre as the Grand Crosses, but without a gold Maltese Cross thereon. The star of the civil Knights Commanders is of the same form and size, only omitting the laurel wreath round the circle containing the motto, and the escrol with the words, "Ich Dien" underneath. Motto - Tria juncta in uno. The Officers of the Order are : - the Dean; the Genealogist, and Blanc Coursier Herald ; the Bath King of Arms; the Registrar and Secretary; the Gentleman Usher of the Scarlet Rod and Brunswick Herald ; and the Messenger.